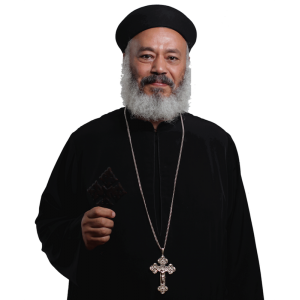 Father Raphael Morcos Hanna was born on October 19, 1956. He earned a degree in Pharmacy in Cairo in 1979. He also earned an MBA in Marketing from Southern University, Washington in 1994. He worked as a Pharmacist and Medical Representative for a Drug Company in Cairo for 12 years. He lived in Dubai for about 7 years and worked as a Pharmaceutical and Marketing Manager. He served as a Sunday School Teacher and Youth Leader both in Cairo and Dubai. He was ordained presbyter by His Grace Bishop Serapion on July 12, 1998 and served at Archangel Raphael and St. Mina church in Palmdale from 1998 to 2003, when he began his current service at St. Mark Church (Los Angeles). On Sunday, August 7, 2016, he received the priestly dignity of the rank of Hegumen.